The number of incoming students receiving Presidential Scholarships is at a record high this year because of the University's increased commitment to diversity and academic excellence. Pictured is incoming Presidential Scholar Ajla Sahbegovic with President Stroble. ST. LOUIS - Webster University has tripled the number of students receiving Presidential Scholarships in the past two years. Fifteen students will receive the full-tuition award that is the largest academic scholarship offered to any student at the institution when they start school in the fall. This is the largest number of Presidential Scholars in the history of the award. The 15 awardees boast an average GPA of 4.28 and exceptionally strong standardized test scores. The Presidential Scholarship is a comprehensive full-tuition award for outstanding undergraduate students who enroll at Webster as first-time freshmen. Awards for 2018-2019 will be valued at more than $110,000 over four years. The scholarship is annually renewable, provided students maintain a cumulative GPA of 3.5 or higher while at Webster. The scholarship can be used on the St. Louis campus and at Webster’s international campuses while studying abroad. More than 120 incoming students applied for the scholarship. 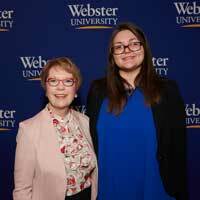 Thirty-two finalists were selected based upon demonstrated academic excellence, involvement with school and community and capacity for future contributions as a student leader at Webster University. Finalists interviewed with faculty, staff, and current student leaders, as well as completed an onsite essay during the Presidential Scholarship Competition hosted by President Stroble and the Office of Admission on Webster’s campus earlier this year. Finalists and their families also attended various interactive sessions to learn more about Webster’s tradition of academic distinction and dynamic student life. With its home campus in St. Louis, Missouri, USA, Webster University (www.webster.edu) comprises an action-oriented global network of faculty, staff, students and alumni who forge powerful bonds with each other and with their communities around the globe. Founded in 1915, Webster is a private non-profit university with more than 14,000 students studying at campus locations in North America, Europe, Asia and Africa and in a robust learning environment online. The university is committed ensuring high-quality learning experiences that transform students for global citizenship and individual excellence.